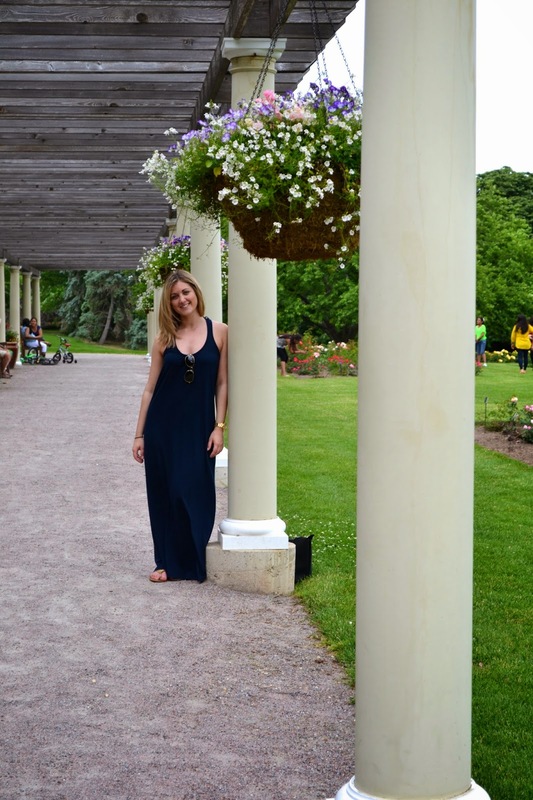 One of my favorite trends for summer is the Maxi dress. You can dress it up, down, lounge around the house in it and you still feel like a million bucks. They are the ultimate comfort item while still allowing you to look glam. I decided to wear one of mine on an outing to Cantigny Park for Father's Day (Made famous by the McCormick's who owned the Chicago Tribune). It was a seriously gorgeous and historical place, and I definitely recommend it to any Chicagoans looking for a fun adventure outside the city! I was able to keep looking' classy while staying cool in the summer heat (which is always my goal in this humid state). I love the simplicity it had in the front; but even better is the back, which cross crosses down for a noticeable flair that I love. Being petite, long silhouettes are hard to get to fit in the right places, I usually try to hunt down something with adjustable straps. However, this dress (by some miracle) fit pretty great without dragging all over the floor. If you find something that hugs your body in the right places, a longer dress can help you look taller. Also, it was pretty affordable! Since longer dresses with more fabric tend to run on the pricier side, a durable well-made dress is a hard find. I grabbed this at forever 21 a while back for a price you can't beat and have been living in it ever since. Luckily, forever has a great selection around this time of year and a duplicate of this dress isn't hard to find. Let us know where you love to shop for maxi dresses. We just can't get enough!